As we explored before with St. Vincent, our eyes are just as important as our ears when it comes to enjoying our favorite concerts. Working in perfect tandem, our eyes soak up the visual stimulation, while our ears absorb the sonic pleasure of the hypnotic rock and flowing melodies pouring forth from the speakers. And when I think back to our adventures at SXSW 2011, I’m reminded how much I loved the performance by The Antlers as they took fans through their lead track “I Don’t Want Love” from their new album Burst Apart, one of my favorite albums of 2011 (so far). And besides the dreamy tunes that engulfed me instantly, I was also captivated by the amazing mural that loomed behind the band as they played at the Stage on Sixth Street. 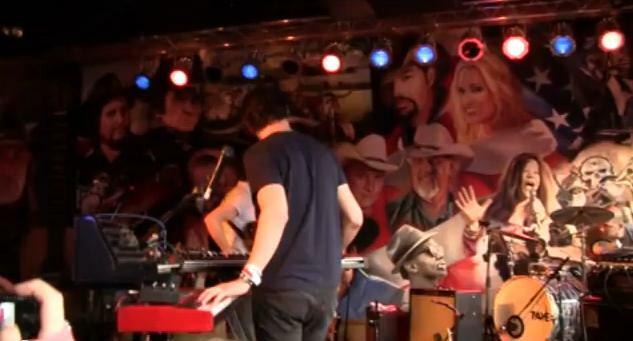 As you see in the video above, the mural beautifully blends in with the band and adds a magical and majestic aesthetic to the show as legendary performers of the past look down on the band almost challenging them and cheering them on with a mighty, stoic glare of inspiration. And as certain points during the show it’s almost as if the mural and The Antlers became one, and I couldn’t tell where the live band begun and where the mural ended! As set rolled on, I couldn’t help but think what those classic performers on the mural would of thought of The Antler’s set. And I also wondered what the Antlers would of thought of a show by Johnny Cash, Janis Joplin and Willie Nelson. And I also wonder what Darlingside, winners of the Seinheiser Hear.IAm contest, thought of the mural while they played earlier that night. I bet they fed off the inspiring vibe too. Were you at the show too? What did you think of the mural? Have you been at a show and been so captivated by the background visuals? What are some of your favorite concert backdrops you’ve experiences during your live music adventures? Download Burst Apart via iTunes, or listen to the album on MOG via their 14-day free trial. And if you’re new to MOG, you can read about why we love sharing info about this very cool and highly addictive music subscription service in our review.